The Pilates Thigh Stretch on the Mat is more of an advanced exercise. I like to teach it to people after they have done this exercise on the Cadillac. Equipment Needed: Mat. Long Pole, if available. Warning: If knee issues, consider hugging a yoga block or skipping altogether. 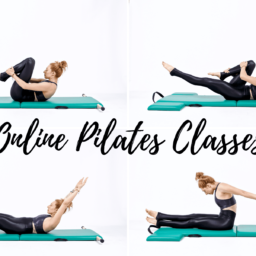 The Pilates Thigh Stretch on the Mat is more of an advanced exercise. I typically like to teach it to people after they have done this exercise on the Cadillac and maybe even the Reformer. The springs on the equipment help assist learning this exercise. If you have a long weighted pole use it to help root your shoulders onto your back. And, be mindful that as you move throughout this exercise that you go to your edge and not beyond it. But, don't shortchange yourself either! Rooting your knees down and pulling your stomach up will help you open the front of your body and strengthen the back side! Feel as if you are hugging your legs towards each and reach down to the mat. Set yourself up standing in your shins feet and thighs parallel to each other. Knees and shins are about a fist distance apart. If you have a long pole, lift your arms up to the sky. If you don't have a pole, imagine that you do and feel as if you have a weighted pole into your hands. Stack your shoulders over your hips and your hips over your knees. As you lower your arms parallel to the floor lean your body back at the knee joint. Then press your shins into the mat and lift yourself back up! It's really easy to cheat and not come all the way up and leave your seat behind your knees. Especially if you have tight hip flexors. Use your shins and your hamstrings to assist you are leaning a little more forward than you would like. This exercise really helps prepare your body for Neckpull and Shoulder Bridge! It's one of my favorites and I rarely skip it in my online mat classes because I feel it is one of the best ways to open up our thighs. Simply stretching your quads isn't going to open them up. You want to require them to activate and then stretch them. This will help them really become flexible!